Taking the proper actions, such as “Drop, Cover, and Hold On”, can save lives and reduce the risk of injury. Everyone, everywhere, should learn and practice what to do during an earthquake, whether at home, work, school or traveling. DROP where you are, onto your hands and knees. This position protects you from being knocked down and also allows you to stay low and crawl to shelter if nearby. No shelter: hold on to your head and neck with both arms and hands. Why Drop, Cover, and Hold On? Read a special report that explains why official rescue teams, emergency preparedness experts, and others recommend “Drop, Cover, and Hold On” as the best way, in most situations, to protect yourself during earthquake shaking. It is important to think about what you will do to protect yourself, wherever you are, when the earth begins to shake. What if you are driving, in a theater, in bed, at the beach, etc.? PERSONS WITH DISABILITIES: See EarthquakeCountry.org/disability for recommendations for people who use wheelchairs, walkers, or are unable to drop to the ground and get up again without assistance. INDOORS: Drop, Cover, and Hold On. Avoid exterior walls, windows, hanging objects, mirrors, tall furniture, large appliances, and kitchen cabinets with heavy objects or glass. However, do not try to move more than 5-7 feet before getting on the ground. Do not go outside during shaking! The area near the exterior walls of a building is the most dangerous place to be. Windows, facades and architectural details are often the first parts of the building to break away. If seated and unable to drop to the floor: bend forward, Cover your head with your arms, and Hold On to your neck with both hands. IN BED: Do not get out of bed. Lie face down to protect vital organs, and Cover your head and neck with a pillow, keeping your arms as close to your head as possible, while you Hold On to your head and neck with both hands until shaking stops. You are less likely to be injured by fallen and broken objects by staying where you are. 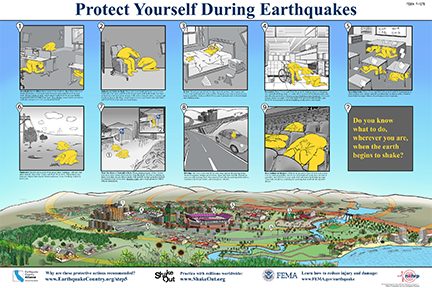 This new FEMA poster depicts how to appropriately respond to an earthquake in a variety of settings. IN A HIGH RISE: Drop, Cover, and Hold On. Avoid windows and other hazards. Do not use elevators. Do not be surprised if sprinkler systems or fire alarms activate. IN A CLASSROOM: Drop, Cover, and Hold On. Laboratories or other settings may require special considerations to ensure safety. Students should also be taught what to do at home or other locations. IN A STORE: Drop, Cover, and Hold On. Getting next to a shopping cart, beneath clothing racks, or within the first level of warehouse racks may provide extra protection. For more details, download a simple PDF fact sheet about Earthquake Safety in Stores. OUTDOORS: Move to a clear area if you can safely do so; avoid power lines, trees, signs, buildings, vehicles, and other hazards. Then Drop, Cover, and Hold On. This protects you from any objects that may be thrown from the side, even if nothing is directly above you. DRIVING: Pull over to the side of the road, stop, and set the parking brake. Avoid overpasses, bridges, power lines, signs and other hazards. Stay inside the vehicle until the shaking stops, then proceed carefully by avoiding fallen debris, cracked or shifted payment, and emergency vehicles. If a power line falls on the car, stay inside until a trained person removes the wire. IN A STADIUM OR THEATER: Drop to the ground in front of your seat or lean over as much as possible, then Cover your head with your arms (as best as possible), and Hold On to your neck with both hands until shaking stops. Then walk out slowly, watching for anything that could fall during aftershocks. NEAR THE SHORE: Follow instructions above for your particular location. Then as soon as shaking reduces such that you are able to stand, walk quickly to high ground or inland as a tsunami may arrive soon. Don’t wait for officials to issue a warning. Walk, rather than drive, to avoid traffic, debris, and other hazards. BELOW A DAM: Follow instructions above for your particular location. Dams can fail during a major earthquake. Catastrophic failure is unlikely, but if you live downstream from a dam, you should know flood-zone information and have prepared an evacuation plan for getting to high ground. Simple videos demonstrating what to do to protect yourself in various situations (near a table, no table nearby, in a theater/auditorium, at the shore, and more to come). Thoroughly review this information, consider what to do in your home or workplace, then practice. It is through actually practicing “Drop, Cover, and Hold On” that we build ‘muscle memory’ to help us respond correctly when the shaking starts. An excellent way to practice how to survive an earthquake is to participate in Great ShakeOut Earthquake Drills when you can rehearse quake-safe actions with millions of other people. It takes 1 minute to practice and is free! Learn more at www.ShakeOut.org. Now that you have learned how to Drop, Cover, and Hold, read about Improving Your Safety in Step 6.